Software is truly eating the world, and it’s an exciting time. There are countless examples: Apple, Spotify, Netflix, Amazon have all transformed the entertainment industry. No longer do we buy books in bookstores, CDs or DVDs. LinkedIn has used software to transform the recruitment industry. AirBnb is revolutionising how travellers book accommodation - using software to turn the traditional hotel experience on its head. Uber is rapidly doing something similar to taxis. These aren’t traditional software companies, they make their money, brand and market themselves selling music, movies, books, recruitment services, accommodation and taxi services, but they’re using software to transform those industries. And soon we’ll see software lead revolutions in industries like transportation with self-driving cars and manufacturing with 3D printing. 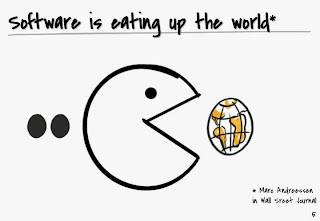 Three years ago Marc Andreesen penned a fantastic article titled ‘Why Software is eating the world’. I’ve been spending time recently reflecting on what kind of company we are at Shoes of Prey and what our objectives are, and I think this article illustrates a lot about who we are. 1. We’re using software to create a unique way for customers to shop for shoes. Rather than selecting from around 100 pairs of ready made shoes off the shelf like a traditional shoe store, our customers can design their own shoes, essentially selecting from 1 of 300,000 trillion possible designs we offer. 2. We’re using software combined with lean manufacturing technologies to transform women’s shoe manufacturing and our supply chain. So we’re a fashion company that, like the companies mentioned above, uses software to create a very unique point of difference, a point of difference that has the potential to transform our industry. Why shouldn’t customers be able to get exactly the shoe they want? We’ve achieved a lot in our short 5 years, but we have a long way to go. There are numerous scenarios where it’s still a better experience for customers to shop in store than buy shoes from Shoes of Prey. If you need your shoes faster than 3 weeks, if you’re not confident enough in your creative skills to design something you know you’ll like, if you don’t want to take a risk with finding a really comfortable fit and want to be able to try the shoes on before you buy them, if the hassle of having to return shoes that are the wrong size is too much. These are all problems we need to solve to become the industry changing company we aspire to be, and we’re using software to solve them. To illustrate what the future of Shoes of Prey looks like: it’s Wednesday morning and our customer Joanne is organising brunch with her friends on Saturday, and she’d love to purchase a new pair of leopard print shoes. She visits Shoes of Prey and we guide her through the process of quickly and easily creating her perfect pair in just a few short minutes. Or perhaps she can skip this design process altogether because we know exactly what she wants before she even has to tell us. Perhaps she’s shared her browsing history with us and we’ve seen she’s been reading fashion articles discussing how leopard print is in this season, she’s shared her calendar so we can see her upcoming brunch event and she’s also shared her wardrobe inventory so we know she has a great dress she hasn’t worn for a while that would go perfectly with a pair of leopard print flats which she doesn’t yet own. So even better than her designing her leopard print flats, before she’s had to think about it, we’ve emailed her a design for a pair of leopard print ballet flats that she loves and can order. When she’s ready to order her shoe she takes out her phone, and captures a short video of her foot. We use that video to create a digital 3D model of her foot and algorithmically convert that into a digital last. We then algorithmically convert her shoe design into a pattern for that last, 3D print the last, midsole, outsole and heel for her shoe. We then take all these components as well as the leathers she’s chosen and using a software driven lean manufacturing process, within 24 hours we manufacture a shoe that’s far more comfortable than any shoe she can get off the shelf. In the same way Amazon have built warehouses in many locations around the world, we’re able to do this manufacturing in numerous locations so we’re able to deliver a customer her finished shoe either overnight or in some cases, the same day it’s been manufactured, so after ordering on Wednesday Joanne receives her shoes by Friday, perfectly in time for her brunch on Saturday! At the moment Shoes of Prey is great for creative types or people looking for something really specific, perhaps for a special event like a wedding, and we've built a good niche business based on this. The scenario I've outlined above would make Shoes of Prey great for the majority of women shopping for shoes, and that's the experience we need to offer our customers to change our industry or 'eat the world' as Marc Andreesen puts it. It's an incredibly hard challenge, but one that's not dissimilar to that faced by iTunes, Spotify, Netflix, LinkedIn, Airbnb or Uber in their industries. The challenges are hard but the rewards are great, and we'll use software within our fashion business to solve them. Thanks for the Post. 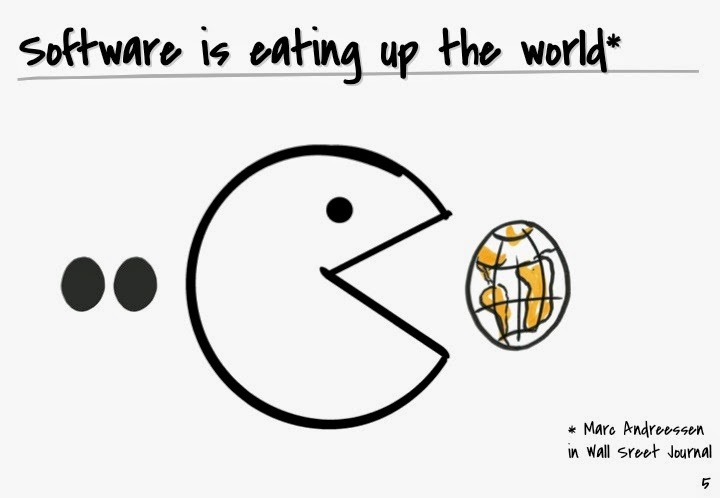 Love the Title - "Software is Eating the World".